Theodor Seuss Geisel, known to the world by his nom de plume Dr. Seuss, is renowned for his books which were mostly written for children, among them The Cat in the Hat, Green Eggs and Ham, Horton Hears a Hoo, and his Christmas tale which has become an essential part of the holiday in America, How the Grinch Stole Christmas. The Grinch alone has become a feature in advertising campaigns, the subject of ornaments, cards, and wrapping paper, and featured in films, recordings, costumes, and other presentations of the yuletide season. Despite being remembered primarily as a writer of children’s books, Seuss (he pronounced it rhyming with voice rather than juice) never had any children of his own. Before he became famous as the author of children’s books, Seuss was a writer and illustrator within the advertising industry, as well as a noted political cartoonist. The skills he developed in those capacities led him to becoming a propagandist, generating both editorial cartoons in newspapers and magazines as well as producing propaganda drawings and films for the United States government both before and during American involvement in World War II. His editorial cartoons displayed a support for President Franklin Roosevelt, Lend-Lease (including to the Soviets), and for the incarceration of Japanese Americans for the duration of the war. In the early days of the Second World War Seuss drew more than 400 editorial cartoons for the New York newspaper PM before shifting his considerable skills of persuasion to the production of propaganda and training films. 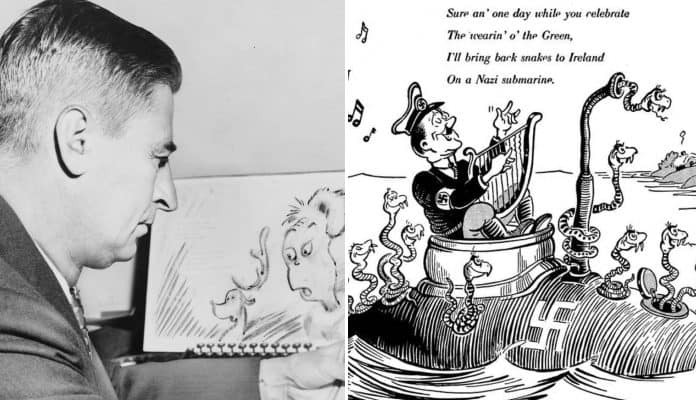 Far from being merely an avuncular writer and coiner of new words for the entertainment of children, Seuss was a scathing political cartoonist and effective propagandist, as seen in these examples of his lesser known craft. Geisel began his career as a writer and cartoonist working for several publications, after adopting his pen name, Seuss, while attending Dartmouth University. He was the editor of the school’s Jack ‘o’ Lantern magazine when he and several others were caught drinking in the dorm, and his participation in all extracurricular activities was suspended in the disciplinary action which followed. In order to mask his continued participation in the magazine he began signing his work “Seuss”. The school’s administrators were aware of the subterfuge, but his work was of such quality that they looked the other way. By 1927, Seuss had acquired national attention with cartoons published in The Saturday Evening Post and Judge, a New York based humor magazine. It was in Judge where the pen name “Dr. Seuss” first appeared. By the end of the 1920s Geisel was contributing to national advertising campaigns as well as producing cartoons for magazines. With success came the opportunity to travel, and he and his wife Helen made several trips to Europe, where he observed first-hand the rise of the Nazis and the Fascists. It was on a return trip from Europe that he wrote a poem which later became the book And to Think I Saw It on Mulberry Street. At the same time his cartoons began to take on a sharper edge in their depictions of the events in Europe, particularly the antisemitism which he had observed, and he confronted the isolationists and America First movements in the United States, with thinly veiled attacks on notable Americans such as Charles Lindbergh. By the end of 1940 he was internationally known, and a noted supporter of the American Democratic Party and President Roosevelt.